Label says "Near Alexandra" which is in Victoria, Australia. Note the tropical radiator, does anyone know the length of the extra piece of the top tank? That's really a nice Photo Dane. I've never seen a belt pulley attachment with it's own belt operated cooling fan. Neat image. Notice blade guard on fan, no blade guard on big saw. Perhaps the drive in the photo here is a similar unit. In the newspaper articles that I have been researching, I came across a description of this or a very similar P.T.O. I'll see if I can find the story. All those dead trees scattered on the hillside, which appear to be what they are going to cut, reminds me of when the Dutch Elm disease swept through our area back in the 1960s. I wonder what kind of trees those are. Eucalptus trees or gum trees for short,a hard wood, several different types, a bit hard to tell on the old photo, large tracks of bush were cleared for farming, first and second war solder settlement allocations had a set time to clear, if not done on time you forefiet the right to own it, the trees would be ring barked to kill them, then used for fire wood, fence posts, rail sleepers and building timber. As dozers got more popular and WW2 tanks could be bought large tracks of land were cleared and just all burnt, guilty myself of that having cleared 2 farms. You may be looking at the fan gaurd the wrong way...is it there to protect the operator?...or the fan from damage? The saw blade needs no protection! I wonder after they were done with work for the day if they removed the PTO unit for the drive home? Here is another photo with a similar PTO, and the saw bench being dragged like a sledge. James,It looks as if the PTO stays in place between jobs. Thanks Kerry for the explanation on the trees. Our buzz saw was staked to the ground with Model T rear axles and was never moved. It was probably a 100 yards from the house. We powered it with a farm tractor. The wood pile was at the saw. Part of my brothers and my after school chores, as kids, was to carry, cart or sled the next days wood to the house. I remember wishing it was closer. 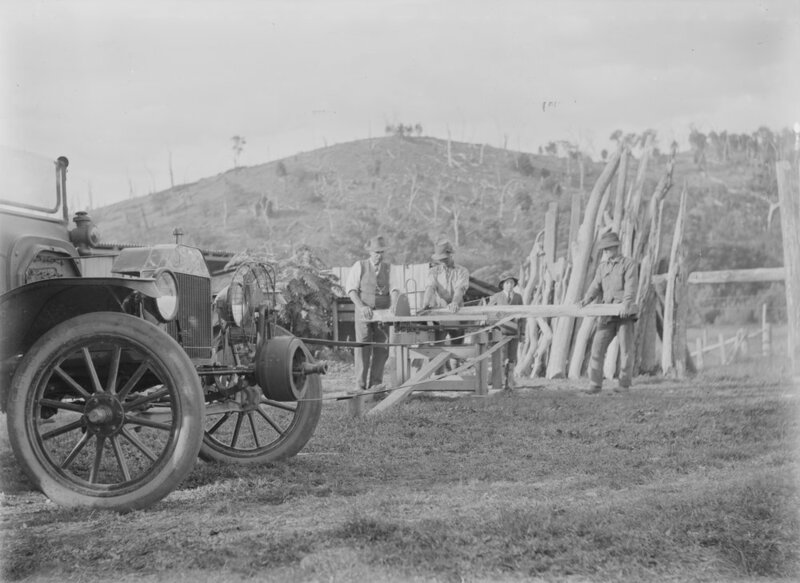 With the pulley mounted transversely to the T wheels, like the above pulley, It probably would have involved a large inching bar to scoot the car or the saw to put tension on the belt. this style would have been a little easier to set up. Thanks for the great photos Dane. 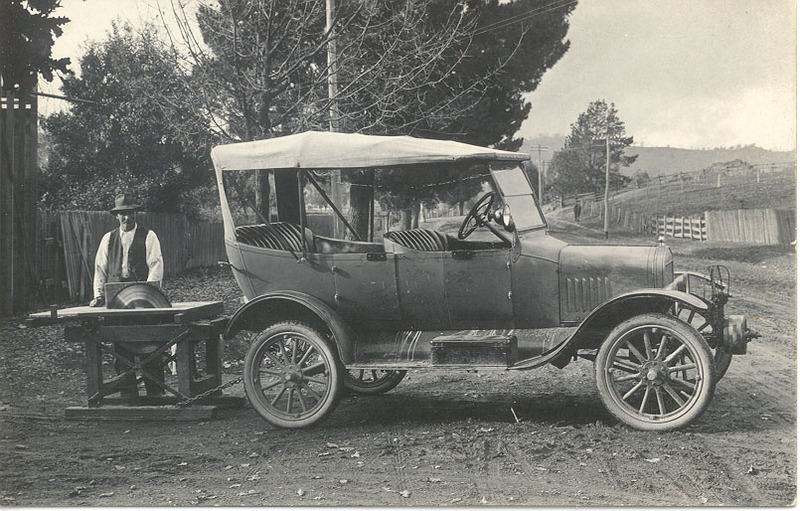 Wonderful photo 0f the tourer towing the saw with chains. 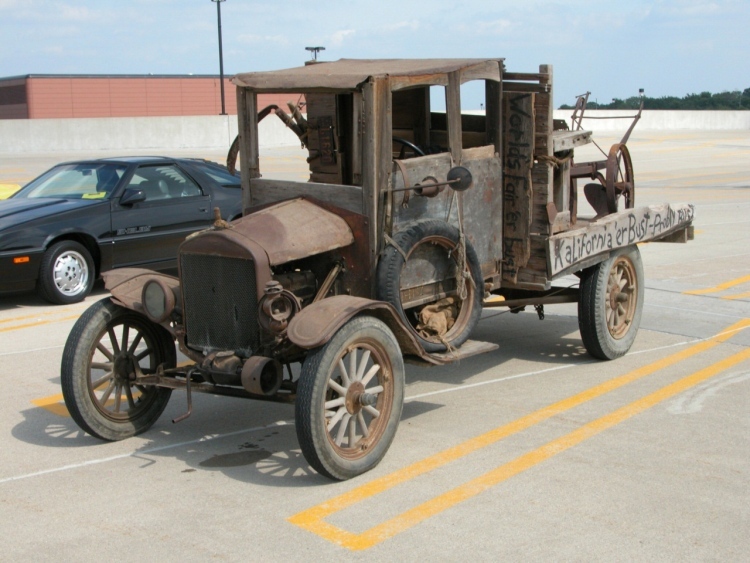 I think it is a Duncan and Fraser bodied car from 1920-1922. The later ones with the high radiator had a curve in the bottom of the windscreen filler and had socket type hood bows. I have never seen an original D&F car with the pinstripe as shown. My Holden bodied car has one in the same location, and it extends across the top of the cowl.